One of many reasons to use the Switched Port Analyzer (SPAN) feature is a Cisco switch is to copy frames out a port that connects to a network analyzer (like Wireshark). Wireshark can then analyze the messages so that you can reasonably interpret the meaning of the messages flowing between the devices in the LAN. One key configuration choice revolves around the choices for what interfaces and VLANs to use as sources for a SPAN session. 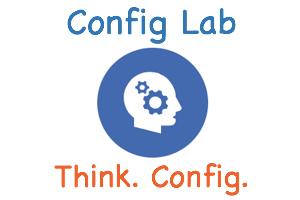 This lab gives you some requirements so that you can exercise that decision making, beyond the simple configuration of the correct SPAN parameters. Configure local SPAN on switch SW1 in the figure. Note that with SPAN it is difficult to capture exactly the subset of messages you want to capture, so you typically capture a superset of messages, and then the tool to which the messages are directed (like a network analyzer) then filters out the messages that should be ignored. The secondary goal: capture as few extra frames as possible, which then requires less filtering on the network analyzer. All devices in VLAN 2 use IP addresses in subnet 172.16.2.0/24, with the last octet of each respective address shown in the figure near the device. 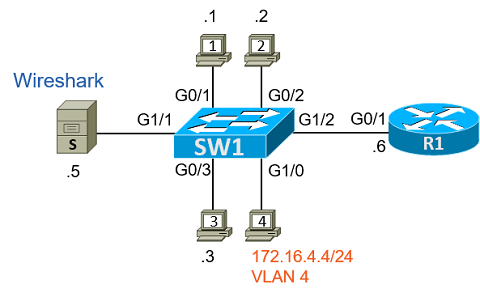 Examples 1 and 2 show the initial configurations on switch SW1 and router R1, respectively. It doesn’t look like VIRL supports the monitor session commands. Yep, my bad, I should have pointed out that VIRL wouldn’t actually do the packet captures with SPAN. I had meant to state that explicitly in that last paragraph, but didn’t. But yes, you can’t test the solution in VIRL. Sorry for the misdirection.